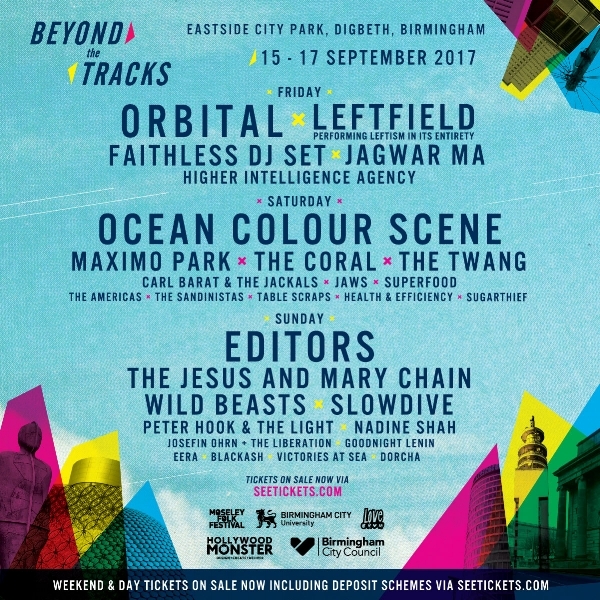 Beyond The Tracks is a brand new, three day, green field festival taking place at Birmingham’s Eastside City Park. Featuring some of the most revered names in UK music and the brightest new stars, the festival is a welcome addition to the musical offering of the UK’s second city. Beyond The Tracks is produced by the local promoters behind Moseley Folk Festival (12 years), Mostly Jazz Funk & Soul (8 years) and Lunar Festival (4 years). They have promoted some of the biggest outdoors shows in the city including performances by Chic feat Nile Rodgers, Public Enemy, De La Soul, Laura Marling, Johnny Marr, George Clinton & Parliament Funkadelic, Bonobo, Roy Ayers, Levellers, Ocean Colour Scene, The Proclaimers, Television and Super Furry Animals.